In general, an autopilot can be used to fly approaches even if the FMC is inoperative (refer to the specific aircraft’s minimum equipment list (MEL) to determine authorization for operating with the FMC inoperative). Whether or not the FMC is available, use of the autopilot should be discussed during the approach briefing, especially regarding the use of the altitude pre-selector and auto-throttles, if equipped. The AFM for the specific aircraft outlines procedures and limitations required for the use of the autopilot during an instrument approach in that aircraft. There are just as many different autopilot modes to climb or descend the aircraft, as there are terms for these modes. Some examples are level change (LVL CHG), vertical speed (V/S), VNAV, and takeoff/go around (TO/GA). The pilot controls the aircraft through the autopilot by selecting pitch modes and/or roll modes, as well as the associated auto-throttle modes. This panel, sometimes called a mode control panel, is normally accessible to both pilots. Most aircraft with sophisticated auto-flight systems and auto-throttles have the capability to select modes that climb with maximum climb thrust and descend with the throttles at idle (LVL CHG, flight level change (FL CHG), and manage level). They also have the capability to capture, or level off at pre-selected altitudes, as well as track a LOC and glideslope (G/S) or a VOR course. If the aircraft is RNAV-equipped, the autopilot also tracks the RNAV-generated course. Most of these modes are used at some point during an instrument approach using the autopilot. Additionally, these modes can be used to provide flight director (FD) guidance to the pilot while hand-flying the aircraft. For the purposes of this precision approach example, the auto-throttles are engaged when the autopilot is engaged and specific airspeed and configuration changes are not discussed. The PF controls airspeed with the speed selector on the mode control panel and calls for flaps and landing gear as needed, which the PM selects. 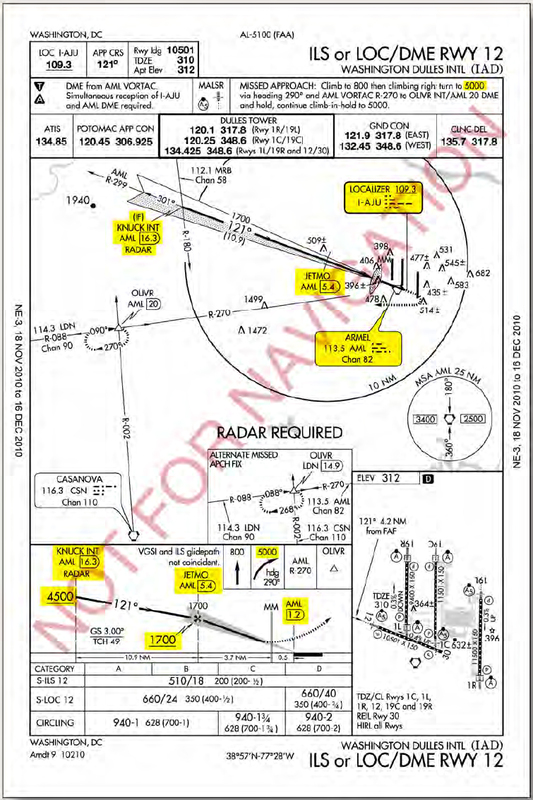 The example in Figure 4-20 begins with the airplane 5 NM northwest of KNUCK at 4,500 feet with the autopilot engaged, and the flight has been cleared to track the Rwy 12 LOC inbound. The current roll mode is LOC with the PF’s NAV radio tuned to the LOC frequency of 109.3; and the current pitch mode is altitude hold (ALT HOLD). Approach control clears the aircraft for the approach. The PF makes no immediate change to the autopilot mode to prevent the aircraft from capturing a false glideslope; but the PM resets the altitude selector to 1,700 feet. The aircraft remains level because the pitch mode remains in ALT HOLD until another pitch mode is selected. Upon reaching KNUCK, the PF selects LVL CHG as the pitch mode. The auto-throttles retard to idle as the airplane begins a descent. Approaching 1,700 feet, the pitch mode automatically changes to altitude acquire (ALT ACQ) then to ALT HOLD as the aircraft levels at 1,700 feet. In addition to slowing the aircraft and calling for configuration changes, the PF selects approach mode (APP). The roll mode continues to track the LOC and the pitch mode remains in ALT HOLD; however, the G/S mode arms. Selecting APP once the aircraft has leveled at the FAF altitude is a suggested technique to ensure that the aircraft captures the glideslope from below and that a false glideslope is not being tracked. Figure 4-20. Example approaches using autopilot. The PF should have the aircraft fully configured for landing before intercepting the glideslope to ensure a stabilized approach. As the aircraft intercepts the glideslope the pitch mode changes to G/S. Once the glideslope is captured by the autopilot, the PM can select the missed approach altitude in the altitude pre-selector, as requested by the PF. The aircraft continues to track the glideslope. The minimum altitude at which the PF is authorized to disconnect the autopilot is aircraft specific. For example, 50 feet below DA, DH, or MDA but not less than 50 feet AGL. The PF can disconnect the autopilot at any time prior to reaching this altitude during a CAT I approach. The initial missed approach is normally hand flown with FD guidance unless both autopilots are engaged for auto-land during a CAT II or III approach. The differences when flying the underlying non-precision approach begin when the aircraft has leveled off at 1,700 feet. Once ALT HOLD is annunciated, the MDA is selected by the PM as requested by the PF. It is extremely important for both pilots to be absolutely sure that the correct altitude is selected for the MDA so that the aircraft does not inadvertently descend below the MDA. For aircraft that the altitude pre-selector can only select 100 foot increments, the MDA for this approach must be set at 700 feet instead of 660 feet. Vertical speed mode is used from the FAF inbound to allow for more precise control of the descent. If the pilots had not selected the MDA in the altitude pre-selector window, the PF would not be able to input a V/S and the aircraft would remain level. The autopilot mode changes from ALT ACQ to ALT HOLD as the aircraft levels at 700 feet. Once ALT HOLD is annunciated, the PF calls for the missed approach altitude of 5,000 feet to be selected in the altitude pre-selector window. This step is very important because accurate FD guidance is not available to the PF during a missed approach if the MDA is left in the window. In IMC, you must continuously evaluate instrument information throughout an approach to properly maneuver the aircraft or monitor autopilot performance and to decide on the proper course of action at the decision point (DA, DH, or MAP). Significant speed and configuration changes during an approach can seriously degrade situational awareness and complicate the decision of the proper action to take at the decision point. The swept wing handling characteristics at low airspeeds and slow engine response of many turbojets further complicate pilot tasks during approach and landing operations. You must begin to form a decision concerning the probable success of an approach before reaching the decision point. Your decision-making process requires you to be able to determine displacements from the course or glideslope/glidepath centerline, to mentally project the aircraft’s three-dimensional flight path by referring to flight instruments, and then apply control inputs as necessary to achieve and maintain the desired approach path. This process is simplified by maintaining a constant approach speed, descent rate, vertical flight path, and configuration during the final stages of an approach. This is referred to as the stabilized approach concept. For all straight-in instrument approaches, to include contact approaches in IFR weather conditions, theapproach must be stabilized before descendingbelow 1,000 feet above the airport or TDZE. For visual approaches and straight-in instrumentapproaches in VFR weather conditions, the approach must be stabilized before descending below 500 feet above the airport elevation. For the final segment of a circling approachmaneuver, the approach must be stabilized 500 feet above the airport elevation or at the MDA, whichever is lower. These conditions must be maintainedthroughout the approach until touchdown for theapproach to be considered a stabilized approach.This also helps you to recognize a wind shearsituation should abnormal indications exist duringthe approach.